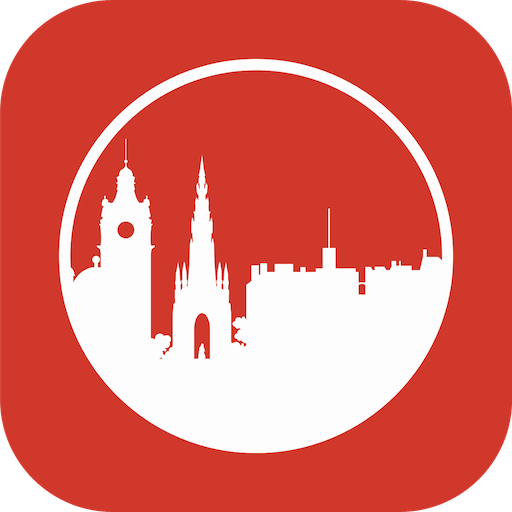 Never let it be said that I’m not swayed in my eating decisions by the names of places. 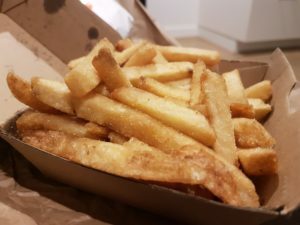 When a solid level of decisiveness set in – I couldn’t even work out whether to dine out, order in or grab takeaway – a place called Lord of the Fries swooped in to the rescue. It seems to be a fairly well established purveyor of vegan favourites having built from the humble beginnings of a chip van. I toddled along to their branch in the mall complex around Central Station. A simple counter set-up, I stared blankly at their menu boards for a good while before settling on the parma burger and classic fries. These came to a total bill of $16.50. I strolled back towards my abode and with regulation photos taken I tucked in. 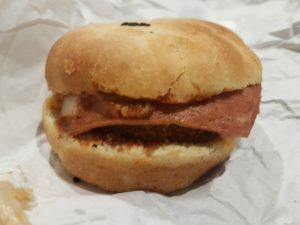 The parma burger was a vegan take on the chicken burger topped with ham, cheese and pizza sauce. It was really pretty good with a good variety of textures and flavourful elements. The chips were served skin-on as is their classic recipe. They were good with a pleasing crunch resolving to a good fluffy centre. However, they were the saltiest fries I’ve ever encountered. I think the way with the place is that you top the fries with a combo of their dressings and sauces, but this much salt as a base layer felt very excessive. Maybe I got a double shake because I hadn’t opted for sauce but even so. 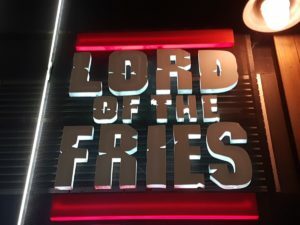 So overall, there are few greater pleasures than finding an eatery with such a fantastic name as Lord of the Fries. As a sort of vegan junk food place, I really quite enjoyed it. I would have enjoyed it more if they’d been just a touch less heavy-handed with the salt, but otherwise this is a place very much worthy of your attention.